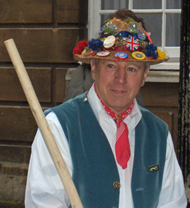 Len joined the Morris in 1992, serving as Squire for The Side from 2002 to 2004. One of several musicians in The Side, playing the English concertina, bodhran and bones. He is rumoured to possess a melodeon and even to have played it for the dance on occasion, but no substantive proof exists. Currently Foreman for the Bampton tradition.